U.S. Army special forces Master Sergeant Eric, center, who would only give his first name in accordance with special forces security guidelines, speaks with troops from the Central African Republic and Uganda, in Obo, Central African Republic, Sunday, April 29, 2012. OBO, Central African Republic — Six months after President Barack Obama ordered 100 elite troops to help capture the messianic warlord Joseph Kony, U.S. military commanders said Sunday that they have been unable to pick up his trail but believe he is hiding in this country’s dense jungle, relying on Stone Age tactics to dodge his pursuers’ high-tech surveillance tools. Kony and his brutal militia, the Lord’s Resistance Army, have slowed their pace of rapes, abductions and killings in recent months. Under renewed international pressure, LRA fighters have slipped deeper into the bush, splintering into smaller bands to avoid detection and literally covering their tracks, according to U.S., African and United Nations officials who are collaborating on the hunt. Kony, a Ugandan guerrilla who began his uprising in the 1980s, long ago ordered his followers to stop using radios and cellphones to avoid leaving an electronic trail. Nowadays, officials said, his 200 or so fighters rely on foot messengers and preset rendezvous points to communicate. Kony’s methods have proven effective against the U.S. military’s satellites, sensors and other forms of surveillance. Commanders warn that it could take years to find him. Since October, U.S. troops have fanned out to five outposts in four countries, advising thousands of troops from Uganda, the Central African Republic, South Sudan and Congo who are hunting Kony across a territory the size of California. In Obo, the terrain is so remote that it took the U.S. military four months to carve out their jungle camp. For the first time, American military officials provided details of their hunt for Kony in extensive interviews over the past week in Africa and Europe. The interviews culminated Sunday with a visit to Obo, where the military arranged for journalists to arrive on chartered Cessnas, scattering stray dogs while landing on a makeshift dirt runway. A team of about 20 Green Berets from the U.S. Army has set up camp in Obo, a remote town in the southeastern corner of the impoverished Central African Republic. The military would not permit journalists to tour the American camp, which villagers described as being protected by razor wire and cameras, but granted interviews with the local U.S. commander and security forces from Uganda and the Central African Republic who also are based here. The Americans said they rarely leave the vicinity of their camp and do not go on patrol, leaving it to their African partners to send trackers into the bush. Instead, they spend most of their days in meetings with African troops and local officials, guiding operations and offering technical advice. The U.S. forces carry arms but are not permitted to engage in combat, except in self-defense. They said they have not encountered any of Kony’s forces directly. The U.S. government declared the LRA a terrorist organization a decade ago and has given the Ugandan military equipment and advice for years. But Obama raised the stakes of American involvement in October by ordering troops into the field, even though the LRA does not pose a direct threat to U.S. interests. The military operation has broad support in Congress and among human rights groups, which say American intervention is necessary to prevent LRA atrocities. The hunt for Kony has drawn fresh attention after the recent release of videos produced by the advocacy group Invisible Children, including one titled “Kony 2012” that has gone viral on the Internet. About half of the U.S. contingent is based at a joint operations center near the international airport in Entebbe, Uganda. The rest of the troops are divided among four far-flung camps in Dungu, Congo; Nzara, South Sudan; and Obo and Djema in the Central African Republic. Perhaps the Americans’ most valuable function is to analyze bits of intelligence about the whereabouts of LRA fighters, both from electronic and human sources, and share the information with their African partners. Kony has long evaded capture by crossing borders and exploiting the inability of regional governments to work together effectively. U.S. officials said that the intelligence picture is improving but that it is difficult to distinguish bogus reports from rare, legitimate LRA sightings. They said villagers tend to blame Kony’s gang for all forms of banditry and crime, whether or not it was really responsible. “Sometimes they just said it’s the LRA because they knew we’d jump on it. . . . It’s almost muddied the waters a bit,” said Greg, a lanky 29-year-old Army Special Forces captain from Texas who commands the U.S. camp at Obo. Military officials would identify him only by his first name, citing security concerns. Another complication is the remoteness of the region, where even dirt roads are scarce and it can take weeks for word of an encounter with the LRA to reach authorities. The Green Berets said they were bracing for nonstop rains in a few weeks, which will turn the ground into mud soup and make it difficult to reach Obo by road. “All these little nuances we didn’t imagine when we first got here are now rearing their head,” Capt. Greg said. Rear Adm. Brian Losey, commander of U.S. Special Operations forces in Africa, said the hunt largely has been a process of elimination. 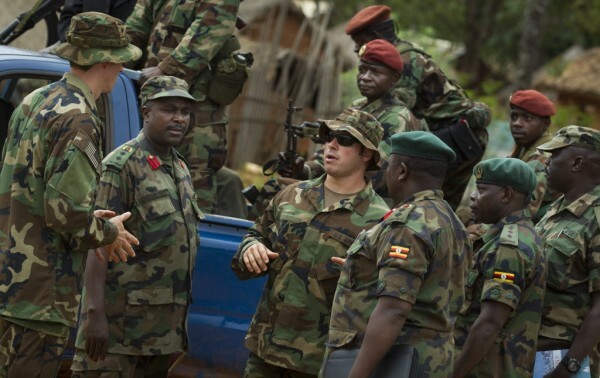 U.S. and African troops are guessing Kony’s whereabouts based on his past movements and by ruling out areas where he is unlikely to obtain shelter or sustenance. Although U.S. officials concede that Kony is proving elusive, Ugandan military officials have been quick to assert knowledge about his whereabouts, even when their guesses contradict each other. On Sunday, Col. Joseph Balikuddembe, the commander of Ugandan forces chasing Kony, pronounced that the LRA leader was hiding in the Central African Republic, in an area about 75 miles northwest of Obo. In contrast, Col. Felix Kulayigye, the chief Ugandan military spokesman, insisted that Kony was several hundred miles away in Sudan, alleging that the LRA was receiving uniforms and other support from the government in Khartoum. U.S. officials suggested that the Ugandan spokesman was pointing the finger at Sudan for political reasons. Although Sudan has armed the LRA in years past, Donald Yamamoto, a senior State Department official, told a Senate panel last week that “we have not seen the evidence” Sudan is currently sheltering or supporting Kony. Meanwhile, U.S. officials have tried to play down African expectations that the American military involvement will hasten Kony’s demise. They acknowledged that the hunt could take many months, or years. Ham said he would not consider the mission a success until Kony is dead or imprisoned, however long that might take.